Disc golf is easy to learn. It does not have a complex system of rules. The objective is simple — get your disc in the target with the least amount of throws. Most people can pick up the basics and can get relatively competitive after playing just a few times, yet, disc golf can take a lifetime to master. Unlike traditional golf, disc golf doesn’t require the time commitment that traditional golf does. While a tournament round of disc golf can take several hours, a casual nine hole round can be completed on your lunch break. As most disc golf courses are on public lands that are free to play, you don’t need to schedule a tee time and can show up to play just a few holes if you don’t have time to play the entire course. To increase the exercise benefits, some disc golfers play a version of the sport that factors in both speed of play and overall score. Disc racers can complete 18 holes in less than half an hour. Disc golf is a sport you can fully enjoy by playing alone. With busy lives that most people live today it’s hard enough to get a few friends together at the same time, let alone gather 20 people for a game of softball. While disc golf leagues can be set up with large groups of people, much more common is lone casual round. With disc golf aps and websites, players can still compete against each other even when they aren’t actually playing together. Paul McBeth, the top rated disc golfer in the world, started playing disc golf in large part because he wasn’t interested in being social, and disc golf was something he could play alone. Almost 90% of all surveyed disc golfers at least occasionally play disc golf alone. 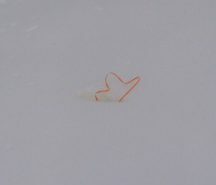 When there is significant snowfall disc golfers tape ribbons on their discs to help find them when they sink into the snow. 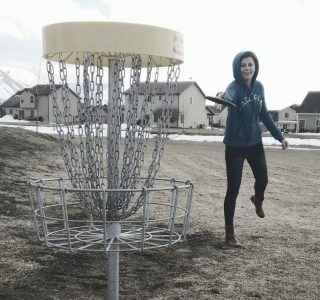 According to the 2016 State of Disc Golf, 79% of surveyed disc golfers play at least 2-3 rounds a month during the winter. Disc golf is played all day and even at night. Many disc golfers wake up early in the morning to get a round in before work. Some disc golfers don’t mind playing in the heat of the day, and disc golf is also played at night with glow in the dark discs and LED lights. You aren’t going to find many other sports that are regularly played as much of the year and as many hours of the day. 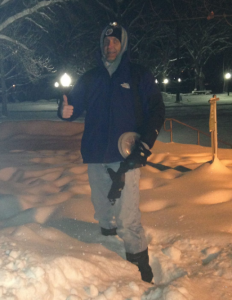 If they’re really crazy, disc golfers like Ted Hegemann will play disc golf in the snow at night in sub zero temperatures. For disc golfers interested in socializing and meeting new people, most areas have local clubs and disc golf leagues. Most of the surveyed disc golfers have actively participated with a local club or league. Disc golf tournaments allow the game to be treated as serious competitive sport with strict rules and codes of conduct. Disc golf tournaments is one of the fastest growing segments over the last five years. Nearly 72% of surveyed disc golfers participated in at least one tournament or event. There are all sorts of different varieties of disc golf. Disc golf can promote teamwork through doubles and team play. You can also play skins, match play, ace runs, birdie bashes, or a number of other variations that keep the sport fun and innovative. When you are on vacation, and are looking for an inexpensive thing to do, trying out a new disc golf course is a great outlet. Serious disc golfer may even plan their vacation around areas that have lots of quality, high rated disc golf courses and hit up as many different courses as they can. If you have a quality course in your area, people will go out of their way to experience it. 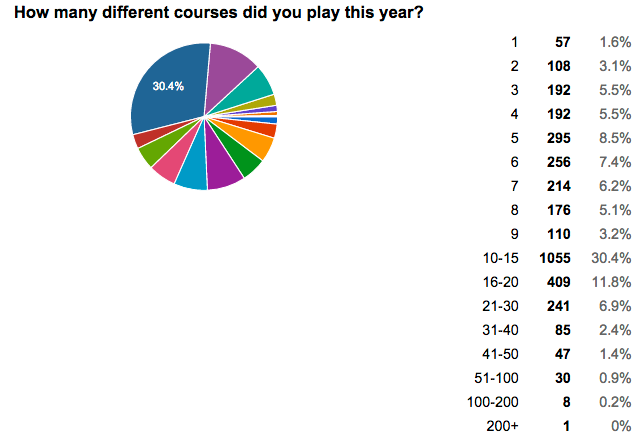 More than half of all surveyed disc golfers played at least 10-15 courses in the last year.